Be careful where you step, especially in the fall. 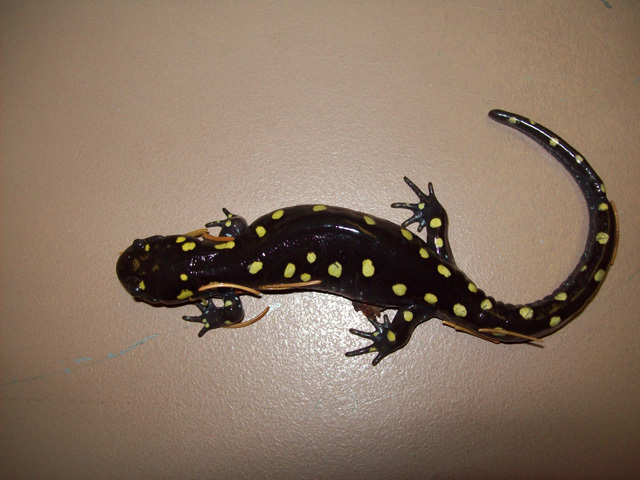 These slimy amphibians like to hide in dark, damp places such as underneath leaves. This particular salamander was found and brought in to the cemetery office for a photo shoot by a visitor. Because we have a pond you can be sure that these little spotted creatures will continue to lay their eggs there and wander about the cemetery looking for good places to hide. So keep a good eye out for them. And don’t worry, their poisonous secretions are not harmful to human beings, only to their predators.